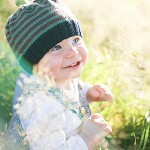 Beanie handmade in organic Australian merino wool. It is very soft & cute for babies and toddlers from around 1 to 2 years of age. The stripes are dark green and purple and navy with a lime green top knot.